So you're in charge of the classroom Valentine party this year and not sure where to begin? These Valentine's Day ideas should give you plenty of inspiration. In fact, you might have so much fun planning the party, you'll volunteer to do it again next year. First, ask the teacher how long the party will last and what sort of restrictions there will be. Are there rules about serving homemade food? Do any of the children have allergies? Would she prefer quiet, calming activities or is it OK to play games that move the kids around the classroom? Second, ask other parents to help. You'll need at least a few people to make or buy decorations and food ahead of time, and you'll surely need a couple of adults to help supervise the kids on the day of the party. Don't be shy about asking. Most parents want to participate in the classroom, and many just need an invitation to do so. Make sure you convey any guidelines from the teacher to your volunteers, such as how to handle a child who misbehaves. Valentine's Day can create anxiety for kids who don't feel popular or well liked. They might worry about not receiving as many cards as other children, even if there's a rule that students must bring one card for everyone in the class. As you plan activities, think of ways you can involve everyone and make all the kids feel special. Plan games where everyone wins. 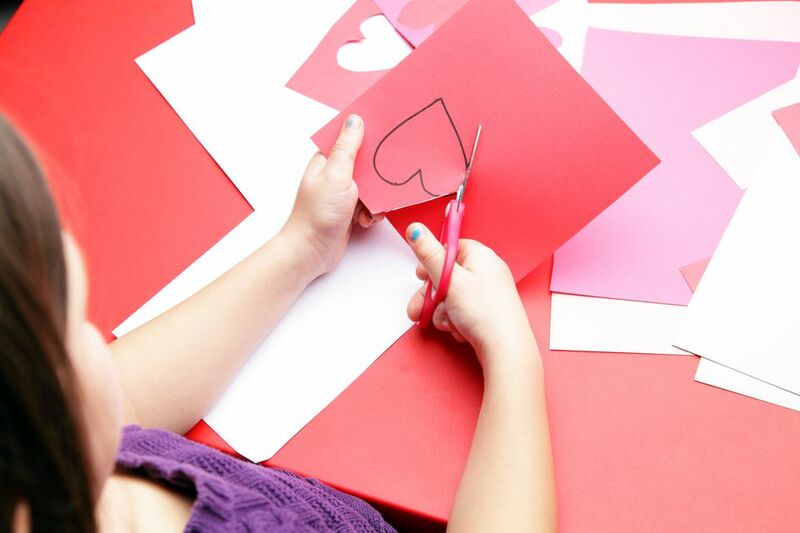 Choose a Valentine's Day craft that's appropriate for the grade level. For younger children, you and the other volunteers likely will need to cut out craft components ahead of time. For any grade level, keep the craft supplies well organized and practice following your own directions to avoid unnecessary chaos once you have 25 or so children making the project at the same time. Spinners are a fun Valentine's Day craft the kids can make and bring home to their parents. Spinners are much like the ones you'd find inside a board game, but when kids make their own they (or you) get to decide what happens when someone lands on a particular slice of the pie. The categories could be "give a hug," "bake a batch of cookies together," "take a walk," or "read a book together." The human heart is about the size of your closed fist. Have each child cut out a life-size heart from construction paper and then use that as a unit of measurement. Create a worksheet with a list of classroom objects the kids must measure "in hearts," such as the height of the door, the width of a desk, the length of the classroom bunny's leap, etc. Consider inviting an expert from your community to the classroom, whether it's a poet who teaches the kids to write a love poem, a barbershop quartet that teaches them some old-fashioned serenades, an artist who helps them paint a romantic picture or a scientist who leads them through the dissection of a pig's heart. Likewise, bring in a botanist, give each child a flower, then have the botanist lead a dissection of the flower, with each child labeling the flower's many parts after attaching them to a piece of paper. Write a collaborative love story on a long piece of receipt paper that you hang horizontally on the classroom's walls. Have each child take a turn or two adding just three to five words to the story and require them to include some sort of romance in the theme. When it's complete, read the story aloud and have the students draw a picture of one of its scenes. Make care packages for troops serving overseas, lost pets at an animal shelter, homeless children or another group in need of love and compassion. Ahead of time, contact each child's parents and ask them to write a love letter to their kids and include a photo of them as a baby. Tell the parents to keep it a secret and then reveal the letters to the kids during the Valentine's party. After the giggling subsides, have the kids write a love letter back to their folks. Tip: This could be a good activity at the end of a unit on how to write and address letters. Take the kids outside or to the gym and teach them how to measure their heart rates. Have them take measurements while they're at rest, after they do some jumping jacks and then after sprinting. Keep in mind that your child's teacher might already have Valentine's Day-related learning activities planned, so talk with her before you plan too far ahead. Once you finish the learning activity, set up a Valentine's Day game. You could have them do something active, such as a game called Who Do You Love? where the kids must scramble to find a new place to sit once a player who's called on comes up with a group of people he "loves," such as "everyone who owns a dog" or "everyone wearing red." Other active Valentine's party games include Catch My Heart, Pictionary and Matchmaker. Or play a calmer game like Candy Heart Bingo or Guess the Number of Valentine's Candies in a Jar. Exchanging Valentines is the climax of most Valentine's Day parties. Many children work hard at home writing their classmates' names, jotting down personal notes or even making cards from scratch. They're excited to give them to their friends, and probably even more excited to see what everyone else brought. Require the students to bring a card for every student in class. Purchase some extra boxes of cards and have the teacher quietly offer them ahead of time to kids who might not be able to afford their own. The teacher might want to have the students make mailboxes or card-collecting pockets ahead of time, too, in order to hold the cards on Valentine's Day. Online resources for printable cards abound, as do ideas for making homemade cards. As the cards are being exchanged, serve the Valentine's Day snacks and treats. The menu might include cookies, mini cupcakes and pink lemonade. Be sure to balance sugary treats with healthier options, such as fresh strawberries or mini bagels topped with strawberry cream cheese. If you need something heartier (no pun intended), many pizza shops offer heart-shaped pizzas around Valentine's Day. Organizing a classroom Valentine's Day party takes time, energy and creativity. Just remember, you're helping to create long-lasting memories for the kids. Hopefully the image of the children clutching their stash of Valentines as they head for the buses will make your hard work worth it.